I have written many times on my blog about the problem of newspaper circulars being thrown onto driveways and not picked up by the homeowners. Locally, The Tennessean puts these in plastic bags, which I usually find clogging the storm drains or left to decompose in the street. 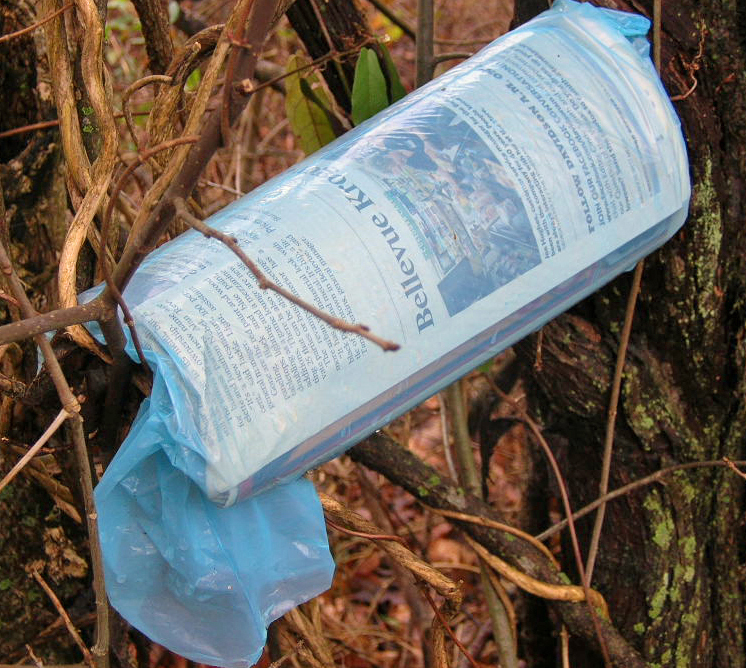 In Atlanta, the Journal-Constitution has been charged with breaking the litter law. Read this online report from cbsatlanta.com. Six-year-old Gunner is concerned about ‘keeping the earth healthy’ and has turned his hobby into a profitable business. The youngster, with a little help from his stepdad, has started Gunner’s Glass Recycling. His concept is pretty simple. When you sign up, he delivers a plastic container with his green “G” logo plastered to the side. And for $5, he’ll pick up your recycled glass twice a month. Gunner and his stepdad then dispose of the items at the Metro East Recycling Center, just a few miles from their home. Gunner has that same passion at home, where he’s known as the recycle police. He monitors what’s thrown away and grabs cardboard, cans and bottles that were not properly disposed of and places them in the appropriate bins. “I look for the symbols on all the bottles and put them in the right container,” he said. His parents are just as surprised as everyone else that Gunner has such enthusiasm on saving the environment. “He was asking about money, so I thought we could combine the two,” said Shawn Sweeney, Gunner’s stepfather. “We go and hang out for a couple of hours on Sundays, and it’s been very good for me. Sweeney says Gunner is already learning it’s a lot smarter to save and not spend all his money. He stashes most of his earnings in his bank account, but keeps some of the money in his piggy bank. Gunner’s business is filling a void for many Lockeland Springs residents. Recycled glass is not collected curbside by Metro Public Works, but residents can utilize the drop off program and take glass, along with other recyclables, to various collection sites. So far Gunner’s up to about 38 customers, many of whom say they are recycling more because of his efforts. Jennifer Cook has been a customer of Gunner’s for about six months and has already referred his services to others. “It’s such a cool thing. I just set the container on the porch and, it’s empty when I get back,” she said. “For $5 a month I get a container and help a kid, so it’s a win-win for everyone. Contact Nancy DeVille at ndeville@tennessean.com or 615-259-8304. He’s become one of the youngest recycling gurus in Lockeland Springs, and he’s giving neighbors a reason to be more environmentally friendly. The local newspaper, The Tennessean, once a week publishes local news for some of the communities in the Nashville area. Until a few weeks ago, this local edition was packaged with ad inserts and mailed to everyone. I gladly received it weekly in my mailbox with other mail. I know that the United States Post Office has instituted changes for different classes of mail such as periodicals and newspapers. Recently I have noticed that this weekly edition of local news is being packaged in plastic and tossed in driveways whether you want the news or not. Most folks do not want it and do not pick it up. I found several today double bagged and wet in the streets of my neighborhood. Unfortunately, The Tennessean is counting on folks to pick up the newspaper out of the street. It is just not going to happen. We recycle our unwanted newspaper. This image of a deer with a jack-o-lantern was published in the Tennessean (Nashville) this morning. Fortunately, the deer was noticed by people who reported it to the game warden. The wildlife officials were able to remove the jack-o-lantern from the young deer, who returned to the wild. Wildlife spokesmen believed that the deer was trying to drink water from an abandoned jack-o-lantern and was trapped inside the plastic pumpkin. During the Great American Clean Up, I have been posting images of litter that can be harmful to wildlife. Please protect the animals.